I stepped outside and noticed the tale-tell sign of a flat tire on my pickup. The rear passenger-side sagged several inches below the rest of the vehicle. A cursory inspection revealed the cause; the tire had picked up a roofing nail somewhere on the road and overnight it had lost most of its air pressure. 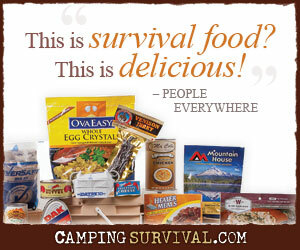 As preppers, we keep seldom-needed-but incredibly-important-when-you-do-need-them supplies on hand. Not only do I have a tire repair kit and air compressor at home, but I have one in each vehicle as well. That’s right. Every vehicle we own has a tire repair kit and mini, 12-volt air compressor hidden away in it. Following the “two is one and one is none” adage, we are prepared for multiple punctured tires while traveling or, perhaps more likely, a spare that’s incapacitated from age or exposure. Realizing that this would be a good learning opportunity for my oldest two kids, I asked them to join me outside before homeschool started. I asked them where they would find the jack and pointed them to the owner’s manual when they couldn’t. In short order they had everything they’d need to help. After loosening the lug nuts and jacking the disabled tire off the ground, I asked my oldest to remove the wheel. He tried and couldn’t. So I stepped in, and couldn’t. I tried for 30 minutes to wiggled the tire back and forth. I hit, I kicked, and I even taunted the tire, all to no avail. I couldn’t move it. It has seized to the hub and I was unable to budge it. Changing a tire is supposed to be a relatively easy task. But I was having trouble. So, as I do with many cases when I’m uncertain of my next step, I turned to Google. I went inside and searched the internet for solution to my problem. Put the lug nuts back on finger-tight. Then loosen each one 2 to 3 turns. Drive forward 4 or 5 feet and abruptly hit the breaks. Put the vehicle in reverse and do the same. Repeat the processes as needed. I tried this a couple of times without success. Finally I heard a loud POP! I jacked the vehicle up and tried once again to remove the tire. It still wouldn’t budge. After a few swift kicks, alternating from the left side to the right, the wheel eventually relinquished its grip on the hub. Minutes later, I had the nail removed, the hole plugged, and the tire inflated and installed. Fortunately, the fix for the stuck wheel was pretty simple. And if I had only known what to do, the whole process wouldn’t have taken very long. But it’s not about the time it took. The take-away from this story is that supplies and equipment are great. But knowledge is critical. As Cody Lundin of Dual Survival fame has quipped “Knowledge is power, and it’s very light weight“. Arm yourself with some knowledge and practice it. Use every opportunity to learn something; it’ll pay off. Great tip. I’ll have to store that one away. Also, I’m impressed with your multiple tire repair kits as well. Confession time: It was Laura’s idea to put the tire repair kits and mini-compressors in the vehicles. I’m thankful that she’s a prepper. This post sure came in handy after I just spent 20 minutes fighting my own stuck tire. Thanks! Thanks for letting me know, Jason! Glad you found it useful!